Along with a 20% discount. 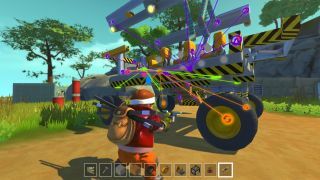 We showcased the best Scrap Mechanic creations back in January, but now those creations, and probably loads more, are on the Steam Workshop, where people can more easily access and rate them. To whack those creations into your game, or to export your fine work to the internet, you'll need to physically access lifts inside the game, which is a nice touch. The Workshop's most popular items include a camper van, this choo-choo train, and even a ferris wheel. Meanwhile, Scrap Mechanic is currently 20% off on that there Steam.